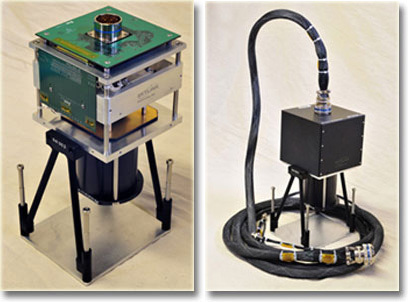 The target is a Nano-position electro-mechanical stage for satellite positioning simulation. Unit provides a thermal signature through germanium optics to simulate sun, earth, and moon position. Smooth precise motion riding on instrument linear bearings. 40mm total travel on both X and Y axis. Built in optical encoder - 1.0µm resolutions. Operational environment 0°C to 60°C. Vacuum compatible to 1X10-6 torr. Requires zero power to hold. This design was upgraded in 2013.